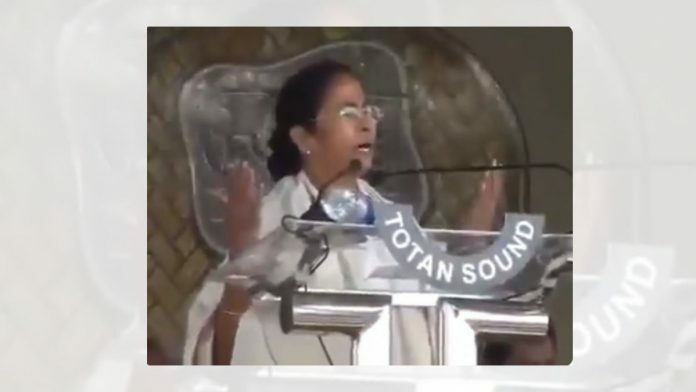 New Delhi: As West Bengal Chief Minister Mamata Banerjee went on a dharna in Kolkata to take on the Central Bureau of Investigation for its probe into Saradha scam, an edited video of her calling on Allah to “bless everyone” took social media by a storm. The video surfaced on social media three days ago after Banerjee’s spat with the CBI this week resulted in opposition parties rallying behind her to counter what they alleged was the misuse of power by the Bharatiya Janata Party-led government at the Centre. However, the actual video is from a January 2018 speech that Banerjee gave during Bengal’s annual Mati Utsav event. Social media users shared the video on platforms like Twitter and Facebook, but primarily WhatsApp, accompanying it with a caption that sought to expose Banerjee’s “true face”. “Despite being a Hindu, she reads namaz,” wrote one user, while others sought to point out her stated “concern” for Rohingya Muslims. The speech in 2018 highlighted the many steps taken by the Banerjee government to ensure farmer welfare in the state. In her speech, Banerjee not only referred to Allah, but also invoked various Gods towards the end. The first supplication is the Sanskrit mantra, “Om mangal mangalya, shive sarvarth sadhike, sharanye triambike gauri, narayani namastute,” which is an auspicious Hindu invocation usually chanted before a person undertakes a venture. Banerjee beseeched not only Allah to bless everyone but also chanted to Guru Nanak Dev (Waheguru ji ka khalsa, Waheguru ji ki fateh) and invoked the Christian God (“May God bless all”).